If you follow me on instagram you’ll know that I am a BIG fan of leopard print. I think it’s such an easy way to give your outfit an edge. 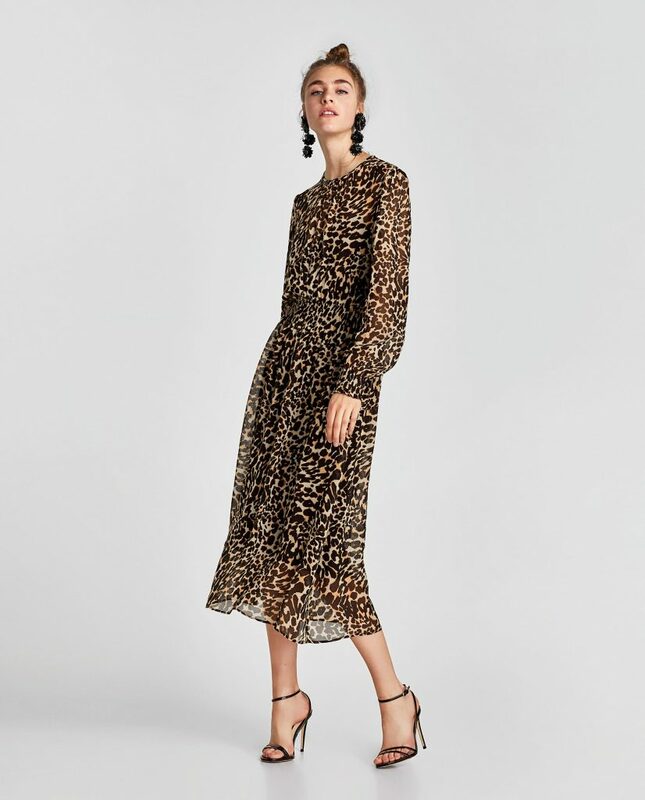 Whether you choose to go the whole hog with a long silk maxi dress or a faux fur coat or prefer to accessorise with a scarf, handbag or shoes, leopard print is ALWAYS a good idea. When it comes to dresses I would stick to below the knee (preferably maxi) and would shy away from anything too short or too tight. I think there is fine line between tasteful and tacky when it comes to the actual print. I don’t really like anything with an orange tone or too big a pattern. 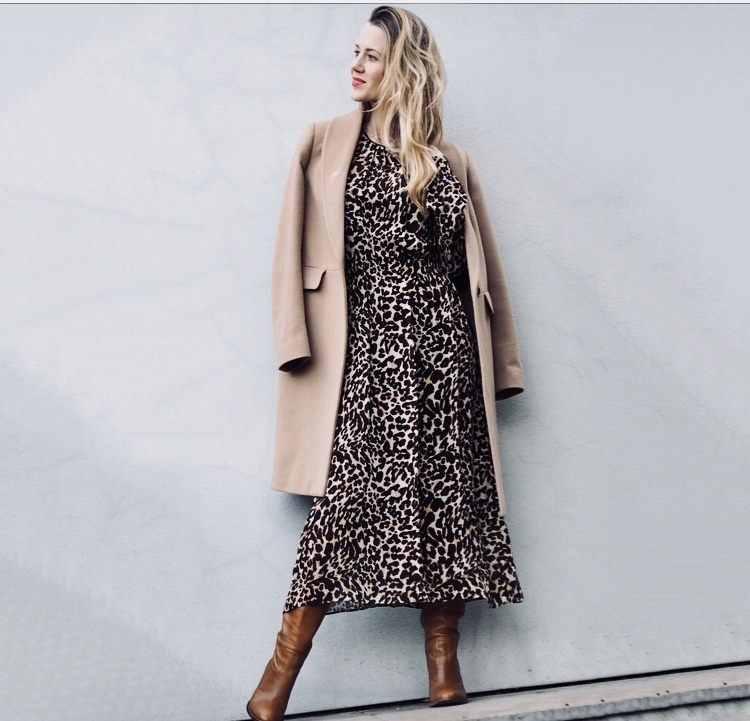 Here are some examples of leopard pieces you WOULDN’T catch me wearing..
And just to prove that I really don’t know what I am talking about, here is an outfit that breaks ALL my personal style rules and yup, she looks AMAZING! But sometimes I think it’s not about the clothes, it’s all about the person wearing them! 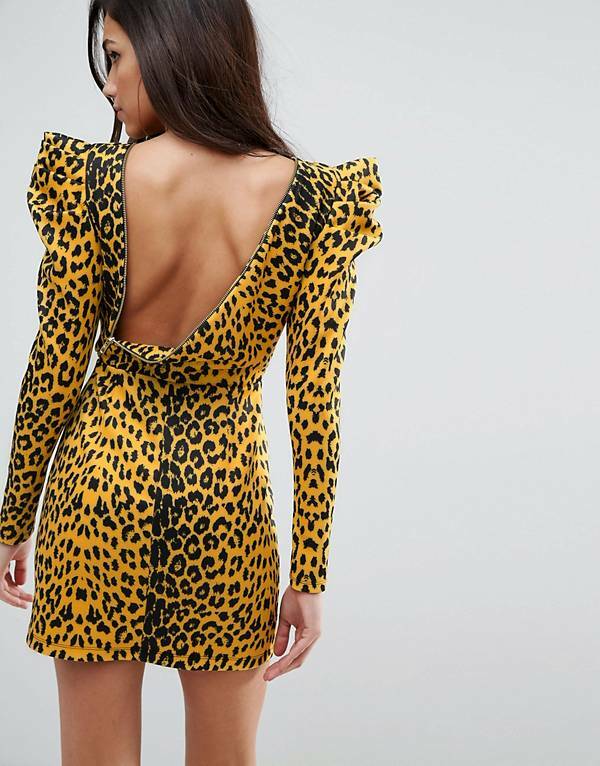 I ordered this dress from Zara (£69.99) which arrived last night. I am undecided as to whether I will keep it as I do struggle a bit with this length. I am wearing it here with tan boots and a camel coat, but I think it would probably look better with black boots and a black coat. I also love the way they have styled it above with black strappy heels. It has a lovely shape and a shirred waist and comes with a gorgeous black satin slip which is separate. Watch out it’s really static material (I tried the safety pin trick and it seemed to help a bit but not completely) I am wearing an XS and would say it was true to size. 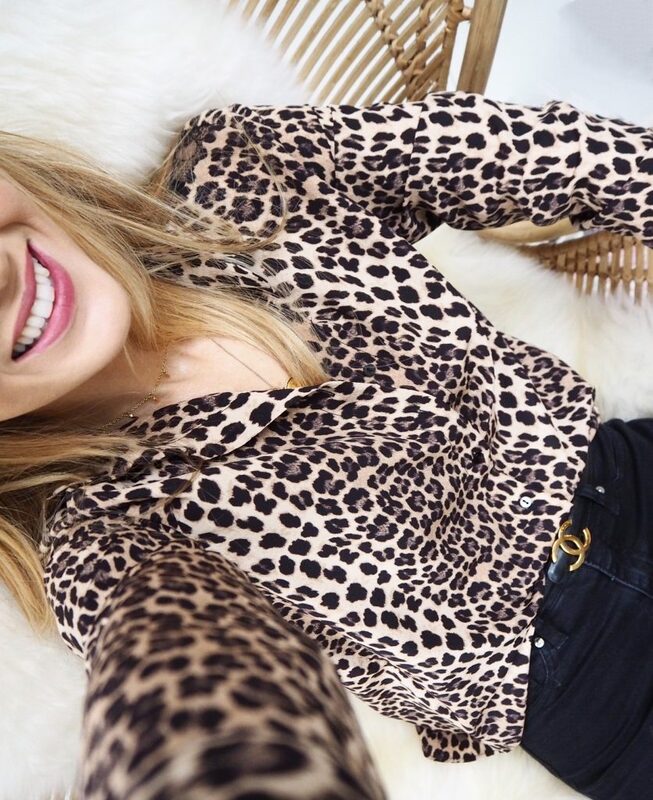 Another recent buy was this leopard print shirt which I picked up for £12.99 in the Zara sale. (now sold out but there are some good options below) I love wearing my shirt with an all black outfit, but it would also look great buttoned up under a bright knit or with blue denim and layered gold necklaces. Worn with Vintage Chanel belt (Vestiaire Collective) and Warehouse black skinnies. 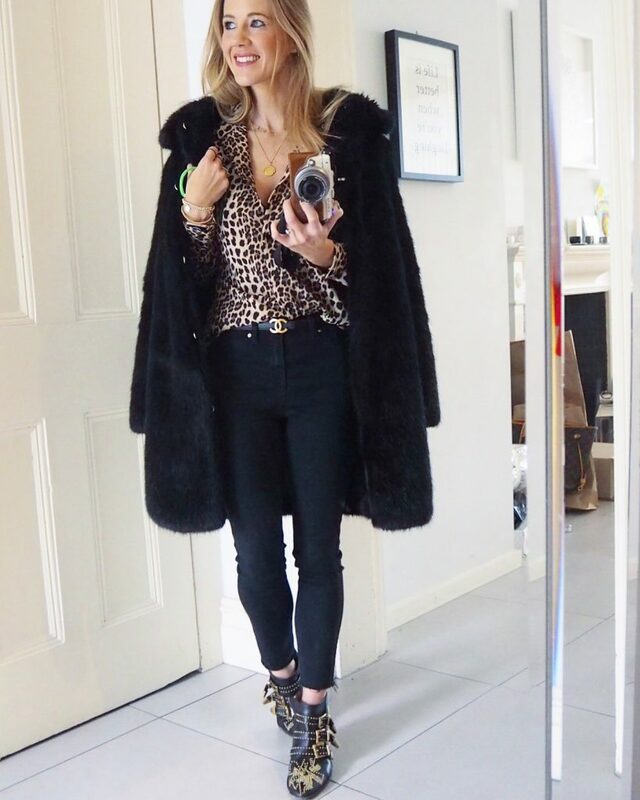 Here are a few of my other leopard print pieces..
A very old coat from Mango. I love pairing leopard with pink and red. I hope you enjoy my little ‘Leopard Boutique’ – hopefully with something to suit all budgets and all degrees of leopard devotedness! Leopard print trousers but think they only work because they are more black and grey than yellow and black- so animal print rather than leopard. Really love the leopard shirt on you. There was me thinking ‘leopard, not really my thing’, I look down and laugh as I’m wearing a breton with leopard print around the neck! The leopard is blue rather than camel and black though, and I suppose that’s my personal style rule – not in natural colours. There aren’t many camel colours that suit me, and I don’t wear black very often (almost never), so it just fits better with my style. I love natural leopard on others, especially a full on dress, but I’m comfortable in my touches in blue (I also have a gorgeous snake print scarf in cobalt, turquoise and grey). I would love a bag in blue leopard! Don’t know whether you’ve guessed but blue is my neutral and statement colour too! !